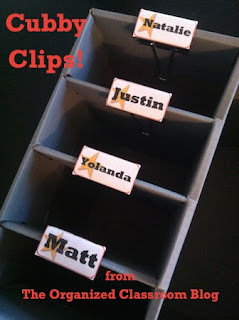 Classroom Freebies Too: Creative Cubby Clips! Grab some large binder clips, and either printed out pages of labels, or actual labels themselves and make your very own cubby clips! See how at the blog! The best part? You can slide them on and off super easy and even change out the theme to match your classroom from year to year as well! Want a set of free Cubby Clip Labels?